The GLC-LH-SMD optical transceiver is ideal for trunking light-to-medium access/aggregation switch traffic on campus networks. This transceiver supports full-duplex 1Gbps transmission over up to 10 kilometers (~6.2 miles) of standard single-mode fiber. While many new access switches support 10Gbps uplinks, lower priced options, like the Cisco Catalyst 9200 product featured in this example, are available at 1Gbps. In this application, traffic aggregated at several Catalyst 9200 switches is redundantly trunked to Cisco Nexus 9396PX core switches. The N9396PX may be equipped with a wide range of optical transceiver interface types across the many rates mentioned above. The tables below include the compatible transceiver types for the two categories of ports in the switch. The table below shows the range of optical transceivers that may be equipped in the C9200L-24P-4G’s 4 SFP slots. 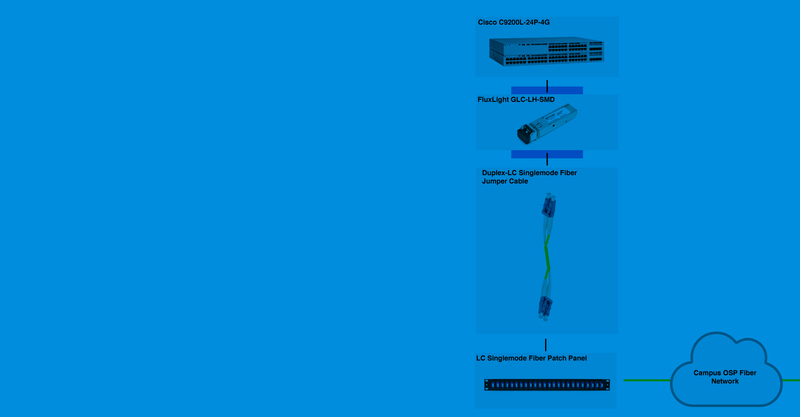 FluxLight’s GLC-LH-SMD (click link for datasheet) is a Cisco® compatible 1000Base-LX SFP DDM Optical Transceiver and is factory pre-programmed with all the necessary configuration data for fully compatible operation with all Cisco equipment offering SFP slots. The FluxLight GLC-LH-SMD includes a dual-LC connector and supports full duplex 1GbE over up to 10km single-mode fiber links. FluxLight’s device performs identically to Cisco® original transceivers, are 100% compatible and support full hot swappable operation. The GLC-LH-SMD is 100% MSA (Multi-Source Agreement) compliant, see: SFP MSA. The major difference between the GLC-LH-SMD and the GLC-LH-SM is the addition of Digital Diagnostics Monitoring, DDM (also known as Digital Optical Monitoring or DOM) as defined in SFF-8472. DDM allows users to locally or remotely monitor the status of critical operating information in the optical transceiver. Monitored status includes current operation temperature, optical transmit power (dBm), optical receive power (dBm), internal supply voltage (Vdc) and transmit bias current. Along with real-time values for each of these parameters, upper and lower thresholds for both Alarm and Warning levels for each are stored in the module’s internal EEPROM. The GLC-LH-SMD modules equipped in the Cisco Nexus 9396PX and Catalyst C9200 switches offer a duplex LC type connector and utilize single mode fiber (SMF) for transmission. Since this application involves transmission over outside plant fiber across a campus, the optical transceiver modules are typically connected to a nearby optical patch panel using a short single mode jumper cable. An example jumper, shown in the figure above, has dual-LC connectors at each end and is 2 meters long. If the fiber patch panel is further away or has a connector type other that dual-LC, of course an alternative cables are available, see: FluxLight OS2 fiber jumpers. The local network connectivity is achieved by inserting a FluxLight GLC-LH-SMD into each switch and then using an appropriate length Duplex-LC SMF jumper cable to attach to a port on the patch panel, as shown below. To create a robust network, each C9200 access switch is dual-homed to two Nexus 9396PX switches. Two FluxLight GLC-LH-SMD modules are equipped in the C9200 switches as shown in the diagram below. Since there are three C9200 switches in the example, a total of three GLC-LH-SM modules must be equipped in each of the N9372 switches. Cisco switches were used to demonstrate the application. FluxLight carries 1000BASE-LX modules compatible with a wide range of OEM switches. Some popular models are listed below.